Discovered 1774 by Charles Messier. Messier 52 (M52, NGC 7654) is a fine open cluster located in a rich Milky Way field. It is one of the rich clusters for which amateur Jeff Bondono has proposed the name "salt and pepper" clusters. Ake Wallenquist (1959) found 193 probable members in a region of 9' radius, and the density near the center is about 3 stars per cubic parsec. The brightest main sequence star of this cluster is of mag 11.0 and spectral type B7. Two yellow giants are brighter: The brightest is of spectral type F9 and mag 7.77, the other of type G8 and mag 8.22. The Sky Catalogue 2000.0 gives an age of only 35 million years, which coincides with the value given by Woldemar Götz, who mentions that this cluster contains one peculiar Of star, i.e. an extremely hot star with peculiar spectral lines of ionized helium and nitrogen. The distance of this cluster is not very well known; Kenneth Glyn Jones adopts 3,000, Mallas/Kreimer 7,000 light years, while the Sky Catalogue 2000.0 gives 5,200 (i.e., 1,600 pc) and Götz 5,050 light years. Robert Garfinkle, in his "Star Hopping", quotes about 3,000, Harvey Pennington and George Kepple and Glen Sanner's Night Sky Observer's Guide 3,900 light years. This uncertainty is mainly due to the high interstellar absorption its light has suffered on its way to us, which is complicated to estimate reasonably. M52 is classified as of Trumpler type I,2,r (Sky Catalog 2000) or II,2,r (Glyn Jones, Götz). Adopting our value of 5,000 light years, the cluster's apparent diameter of 13.0 arc minutes corresponds to a linear extension of 19 light years. 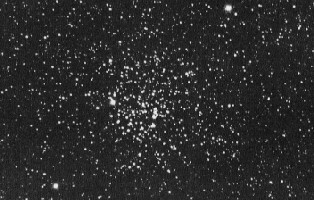 Open cluster M52 is one of the original discoveries of Charles Messier, who cataloged it on September 7, 1774 when the comet of that year came close to it. Amateurs can see M52 as a nebulous patch in good binoculars or finder scopes. In 4-inch telescopes, it appears as a fine, rich compressed cluster of faint stars, often described as of fan or "V" shape; the bright yellow star is to the SW edge. John Mallas noted "a needle-shaped inner region inside a half-circle." M52 can be found quite easily by extending the line from Alpha over Beta Cassiopeiae by 6 1/2 degrees to the NW to 5th mag 4 Cassiopeiae; M52 is roughly 1 degree south and slightly west of this star. Situated about 35' SW of M52 is the Bubble Nebula NGC 7635, a diffuse nebula which appears as a large, faint and diffuse oval, about 3.5x3' around the 7th-mag star HD 220057 of spectral type B2 IV. It is difficult to see because of its low surface brightness. Just immediately south of M52 is the little conspicuous open cluster Czernik 43 (Cz 43), which is visible in larger telescopes only.